Mobile loading dock ramps convert vacant space into a freight-handling center. It’s a versatile piece of loading dock equipment that will expand your present dock capacity and create loading facilities where no dock exists, without new construction. Portable yard ramps provide ground level access to trucks, railcars or buildings. Their mobility makes it easy to move from job to job and handle freight with a fork lift or lift truck virtually anywhere. 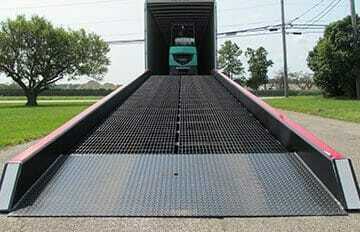 Our wide range of new and used mobile yard ramps come with maximum capacities up to 30,000 lbs. 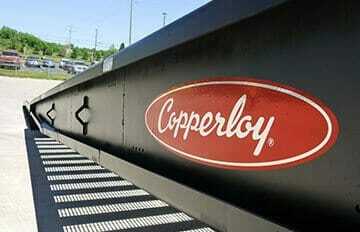 The standard Copperloy loading dock ramp is steel. 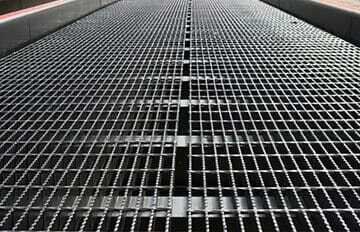 Aluminum ramps with steel grating are available, please contact the factory for more information. Watch the yard ramp video below to learn more. Our portable yard ramps give the forklift easy access to trucks and loading docks alike. Since they are easy to maneuver, they can be useful in most loading and unloading conditions, especially when room is tight and a truck can’t access the loading dock. 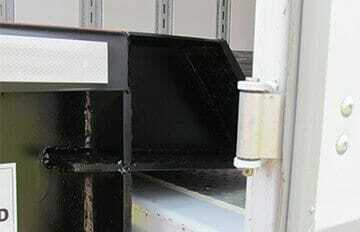 Deep overlap of ramp frame at the high end assures that the ramp rests firmly on the carrier body or dock floor. 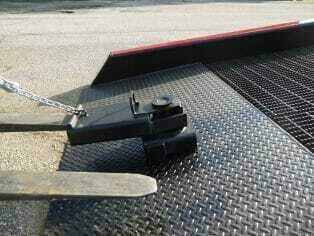 Our mobile yard ramps have eight-foot-long safety chains and hooks to provide added security and increase safety. When correctly rigged, chains join the yard ramps and vehicles into a single unit. 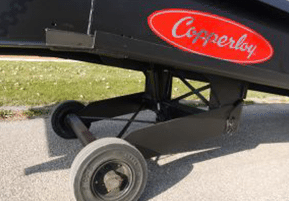 The single cylinder allows the ramp to raise evenly every time. The undercarriage is easily accessible for maintenance and repair. With a single cylinder design, there are less parts to maintain. The single acting hydraulic hand pump design requires half the effort needed to raise ramp compared to other mobile ramps. The pump is relocated so that it is protected away from dirt, debris, damage and makes maintenance easier to perform. The handle is stored out of the way when not in use. Because the end plate is shorter than the wheelbase of most forklift trucks, front-drive wheels can reach high traction grating on the ramp, while rear wheels are still on the ground. 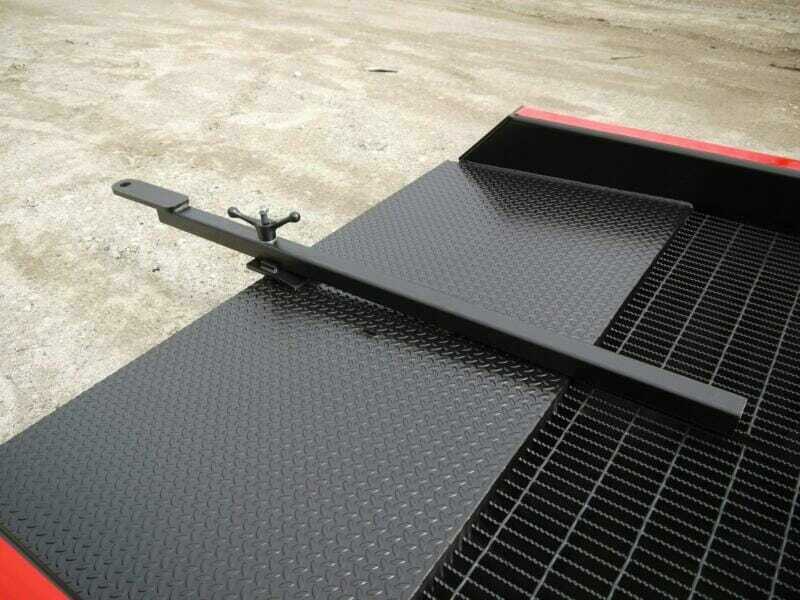 The portable yard ramp 36″ approach plate is beveled from the underside to provide a smooth ground-level entry, eliminating jolts and bumps when fork trucks travel on and off the ramp. 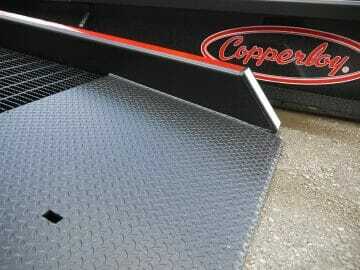 All of our heavy-duty yard ramps are constructed of electro-forged serrated steel for superior strength. Grating bearing bars are 1-3/4″ thick for durability in the roughest of applications. Bars are spaced 1″ apart to resist clogging of debris and to ensure all-weather, high-traction running surface. 7″ safety curbs to prevent accidental runoff. Exclusive hollow section design and proprietary box frame construction take the stress of heavy loads and the extra strain of cargo breakout. The solid/pneumatic tires are standard on all Copperloy mobile yard ramps and are ideal for all applications. The tires do not require air to fill , are maintenance free and have lubricated for life bearings. The position sleeve allows the ramp to maneuver 180 degrees which reduces loading/unloading time and increases productivity. The fork slides into the positioning sleeve and the ramp can easily be positioned into place. 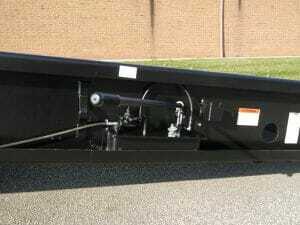 The positioning sleeve is included with all steel mobile yard ramps. The sleeve is not intended for long distance towing. 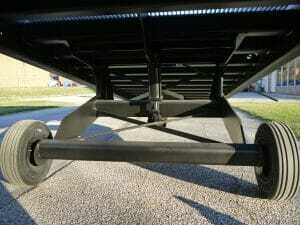 The towbar is an option on both steel and aluminum mobile yard ramps which attaches to the lower end of the ramp. 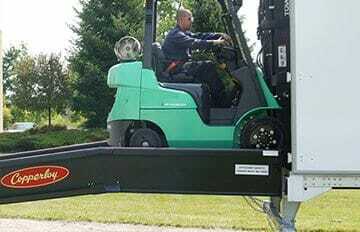 It allows the ramp to be towed a short distance (within your facility). The max towing speed is 5-mph and is not intended for over the road towing.